Post by CM – Celebrating Our 100th Post! Couture is to Ready-to-Wear as Dove is to Pigeon. So maybe this year’s offerings can be said to be less dove and more Fancy Pigeon (which is seriously a thing, I looked it up), owing to an influx of fresh new designers with a more modern approach to high fashion. Not worse, just different and befitting a world which is losing its stuffiness and embracing a youthful, more playful ideology. Couture has always been known to be fabulously costumey and over the top, not particularly influencing trends like the S/S and A/W collectiong do, but giving free reign to designers to create wonderful pieces of (mostly) wearable art.This selection began decidedly pret, with trainers (trainers!) 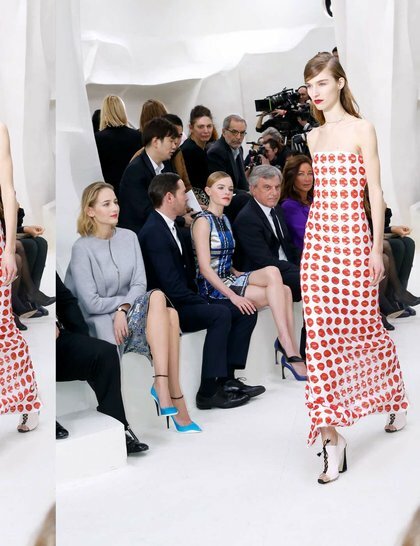 appearing at Dior and Chanel, hemlines being hoiked up and simple, albeit immaculate tailering. The new, young customer to cater for is phenomenally rich, knows what she wants and really would spend thousands on a pair of running shoes. It’s the glamourising of basic items, one which may seem extremely indulgent to us normals but which these people living in their alien world widen their eyes at, and exclaim why had no one thought of it before. What’s next, couture knickers? Probably. Anyway, stylists scouting for Red Carpet looks will need to get their thinking caps (or gimp masks as it may be – as seen at Maison Martin Margiela) on. 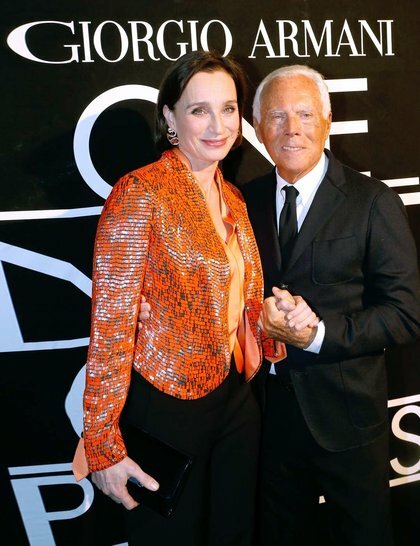 As the week went on things got into a more old-school rhythm, especially at Valentino and Armani, and the showings were generally a triumph. Sergeenko is a much lesser known designer, but is gaining prominence amongst fashion forward women, with quite a few street stylers being pictured wearing her, including her very self. Her show included pastels, stripes and structured luxury, perfect for the lounging lady in a bedoir decked out like Versailles awaiting an unexpected caller. 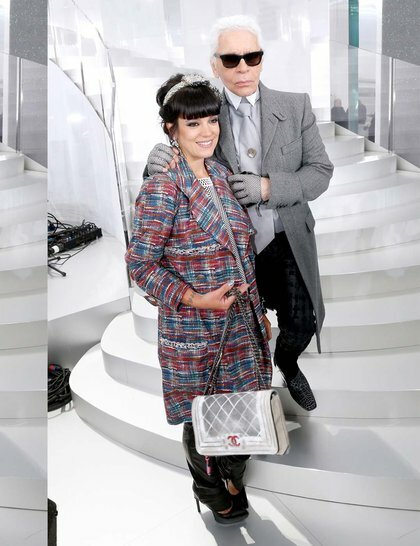 Lagerfeld went decidedly sporty in his show, with bum bags (or fanny packs, whichever takes your fancy), trainers and modern cocoon shapes ruling the runway. Pastels, feathers and delicate beading were also the order of the day, with the above number catching my eye with its lovely, simple fluid shape, reminiscent of Odette’s metamorphasis into a swan. Raf Simons also bowed down to pastels, along with sheer and black, prints, feathery details and laser cuts. It was edgy flirty, with Stella Tennant among the models, and really beautiful. 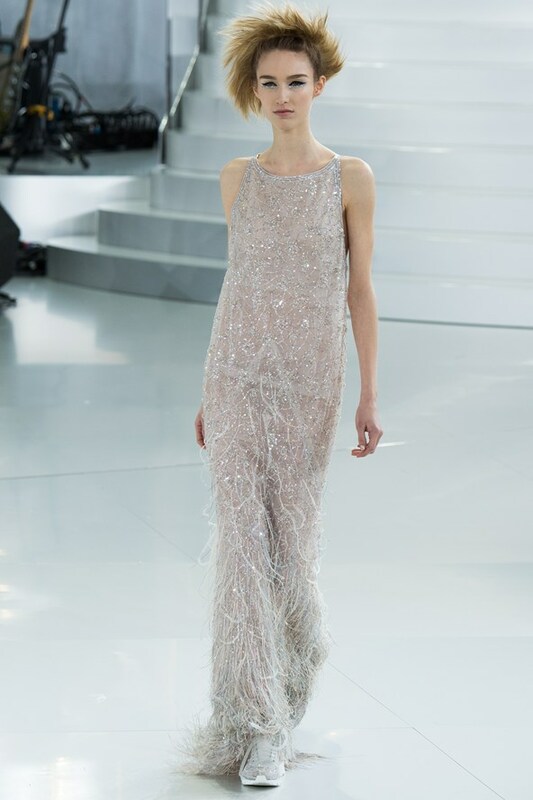 Jennifer Lawerence is sure to be wearing Dior to the Oscars; the look above may be too like her Golden Globes pick but there may well be something in the extensive collection for her to choose from. I loved this collection, and the number above was one of my favourites of the whole week, with its exquisite colour pairing and detail. In general the show consisted of blue, pastels (again), focusing on a priveleged debutante coming of age with materials like satin, with a strong architetural feel along with the strong colours. 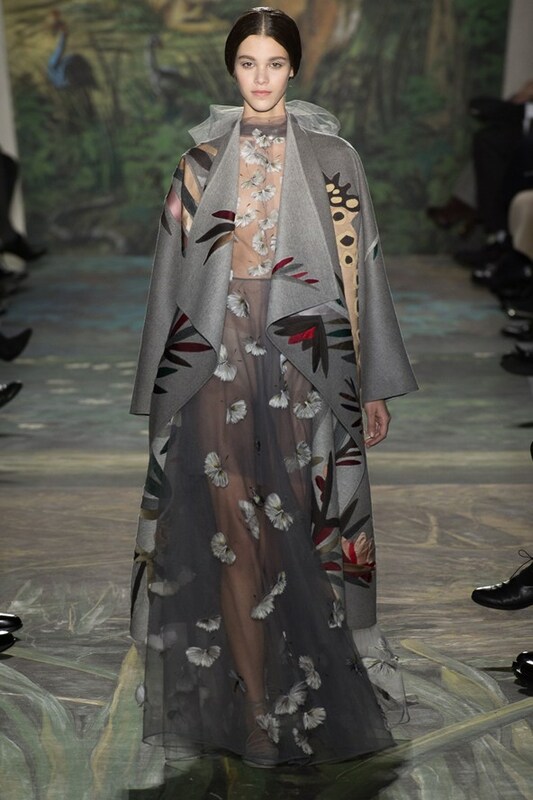 This was gorgeous; mysterious, moody and melancholy, with amazing prints, subtle details and lovely shapes and layering. The colour of the night was purple, with turbans adoring the models heads, giving a luxe, fantasy feel to the whole collection. Not sure if you want a tattoo? Why not wear one? It will only cost you thousands of euros but at least you won’t have to get it lazered off if you don’t like it. The Maison featured current, playful tattoo prints, stripes, strong colours and luxury fabrics. Getting past the unpredictability of it all, the show was wonderful, oppulent and fun. 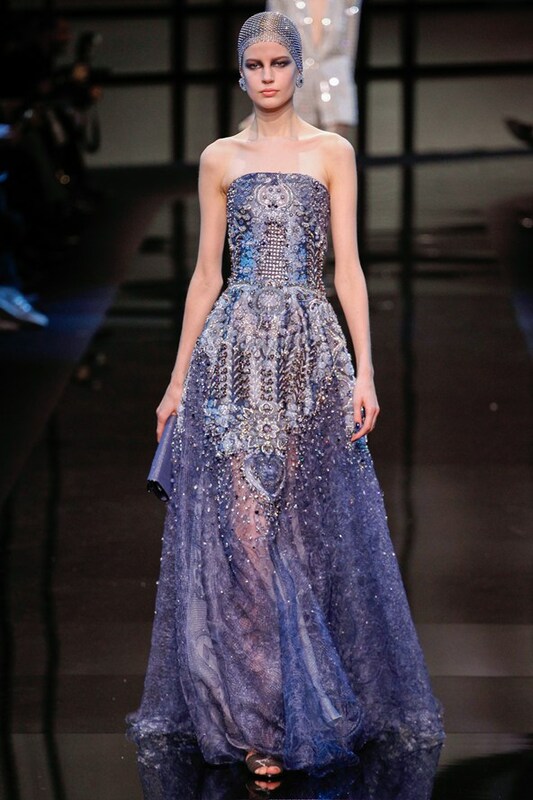 There was a real princess feel at Elie Saab, with pastels, chiffon, soft colours, and ombre effects. It was a dark romance, with flower prints and purples beautifully encapturing the theme. If there’s one designer that will certainly be dressing at least one nominated actress this season it’s this one, but hopefully no one will take a tumble, unlike an unfortunate model did. Though thanks to the dress she was wearing she lookd very elegant on the way down! Remember the dress that Julia Roberts wore to the Golden Globes, that TM hated? It’s a pity she didn’t hold out for this one, which would have gone down so much better, with it’s blood red and netting lying over a no-nonsence crisp white shirt. The rest of the collection reminded me of a flock of birds of paradise, with black and chiffon over-layering rich colours, and shapes contouring and cocooning the curves of the female body. 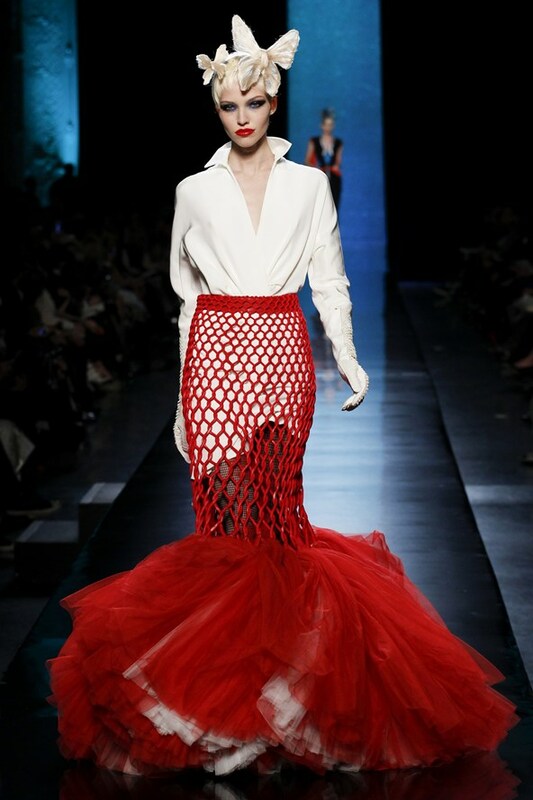 It was an exercise in womanliness made even more astute with it’s finale – Dita von Teese closed the show. In what I think was my best-loved collection, creative directors Maria Grazia Chiuri and Pier Paolo Piccioli created a murky fairy world, with some dresses very simple and subdued in mossy,stoney colours and others opplent and reminiscent of past collections, bringing to mind the duality of a magical world and it’s non-magical occupants, like the land of King Arthur. 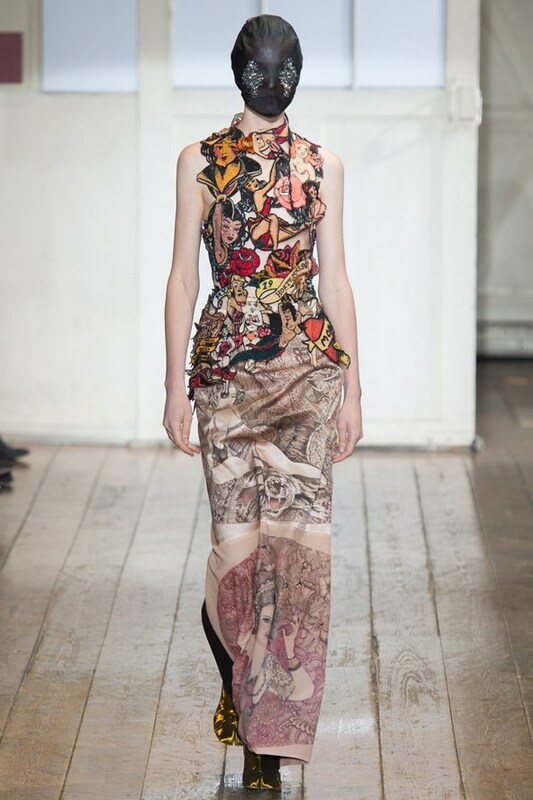 There was a resonance of a medieval infulence, with a gorgeous Adam and Eve print decorating one dress. One of the many standouts was a chiffonny frock with a musical stave embossed on the front, and I particularly liked the mixed textures and colours of the above look. 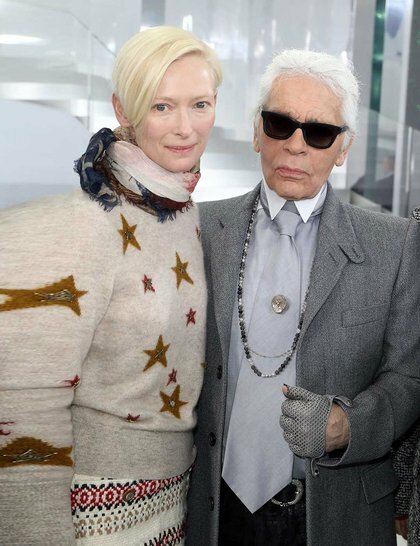 On the front row there weren’t as many familiar faces as you’d expect at the ready-to-wear shows, but die hard fashion fans and brand ambassadors did show up, while Raf Simons at Dior invited fashion students from all over the world to attend his show. Lady Gaga appeared at Versace and promptly asked to wear and then keep a beaded veil, Sophia Loren and (poor old) Kim Kardashian made appearances. LilyAllen showed up at her friend Karl’s show in disturbing leather baggy pants, Tilda Swinton wore a look from the pre-collection.Livia Firth, Kate Bosworth and Leelee Sobieski all looked lovely, but the main attendees at these collections remain editors, stylists and buyers not so eager to be photographed. So ending a spectacular week, there was no cat to throw amongst the fancy pigeons, not even Choupette. Coo.